US rock-reggae band Tribal Seeds takes us on a party trip on their latest EP called Roots Party, out on December 1st. Three and a half years have passed since their last studio album Representing (2014). The band, formed by the brothers Steven (lead vocals, guitar, and producer) and Tony Ray “Maad T-Ray” Jacobo (producer) in 2005, has a massive touring schedule, mainly throughout the US-American continent. It is not surprising that the new EP evolved while on tour. Some of the songs were even recorded on the road, and others in their home studio in San Diego, CA. While Representing was under the production control of Maad T-Ray, Roots Party is mainly produced by his brother Steven, with the exception of Gunsmoke (T-Ray again). The group involved in Roots Party EP also includes Victor Navarro (bass), Ryan Gonzo (guitar, vocals), Luis Castillo (keys, bass, guitar, vocals), Daniel Lopilato (keys), and Jamey “Zeb” Dekofsky (drums). Eight songs or 36 minutes provide everything needed for a perfect short reggae reasoning. Ganja stock? Full! The opening track Aroma sets the listener into the right vibe to feel musically uplifted, not to say high right from the very start. “Aroma of the herb smoke: take another hit and it’s a lift” goes the hook line. Melody, the composition of instruments (sounds like a bagpipe is playing here, too), and the addition of dub effects toward the end of the song are so catchy and well-chosen, this song is a perfect welcome to the roots party. Roots Party, the title track and number three on this release, maintains the high level of musical enjoyment of the previous songs. Tribal Seeds presents to us their values in life (more unity, less hate) and their idea of spending the perfect night along with irie people under the moonlight while the dub sound is playing. That song just makes you want to join them. What else do you need for the perfect night? It’s more than nice to have the one special person you love at your side. That, Tribal Seeds assures us in the next, vivid tune Empress which is dedicated to a girl. A girl is also the main topic in the fifth track, Rude Girl, only this girl is not entirely nice. Torn between dedication and desperation, the singer goes nuts about a girl who is making a total mess out of him. Additional musicians on the sax, trumpet, and trombone give this tune the special touch. Tracks 6 to 8 are the dub versions Roots Dub, Aroma Dub, and Empress Dub. With that, the Tribal Seeds roots party reaches the peak moments of meditation and spirituality. Delays, echoes, and other dub effects on these tunes make this half-hour roots session complete. The Tribal Seeds music vibe is generally an easy-going, smooth roots sound, entirely positive, well-reflected on social issues, and well-recognizable by the distinctive voice of the singer Steven. 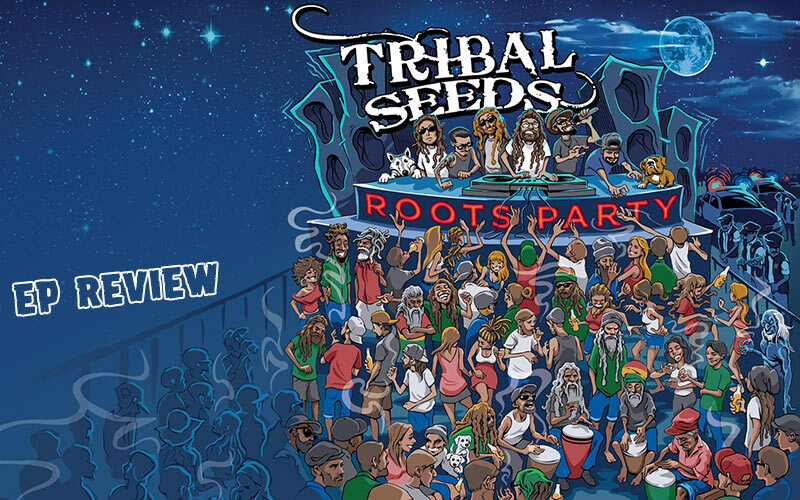 And so is the Roots Party EP: a classic Tribal Seeds release that remains true to the band's style and values. Hopefully, a follow-up in form of a full-length album is coming up next for having a more extended roots party.